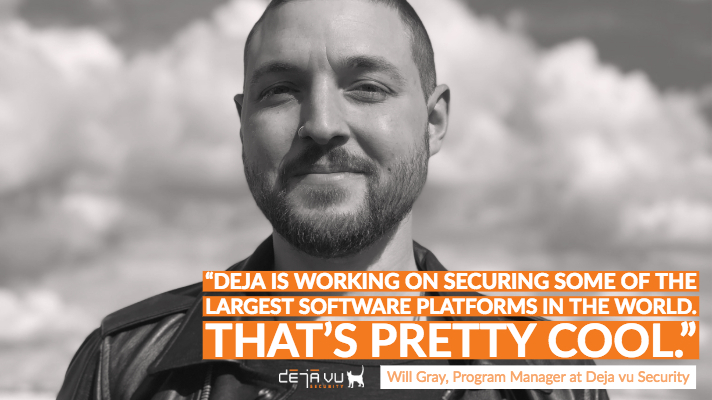 Deja vu Security is a cybersecurity consulting firm known for, in the words of George Hallam (Ethereum Foundation, Melonport), “some of the best minds in the space.” Securing the world’s most prolific technology companies, Deja’s team of security consultants—professional hackers— continues to experience significant growth. But hackers alone cannot scope, build, and track Deja’s many, sometimes massive, long-term projects. Will Gray is a program manager at Deja, one of a number tasked with identifying the parameters of large-scale computer security engagements: What a client and Deja are trying to accomplish, what the boundaries of the project are, who the stakeholders are, and how to keep the project on track. But Gray wasn’t always in cybersecurity project management: Before coming to Deja, he worked for a decade in law. Like many undergrads unsure of their direction in life, Gray says he "messed around" academically for the first two years of college at Washington State University in 2004. He didn't become really passionate about anything until taking a philosophy of political science class during his third year. "I really enjoyed logic and argument, and at that point, I decided I wanted to go to law school." Gray started his law career early while working toward his JD at Gonzaga University in Washington. At a non-profit social justice law firm in Spokane, he worked on public interest cases, such as representing low-income tenants with housing rights issues. Unfortunately, despite his passion for helping "make people's lives better," Gray realized that the work of a lawyer was very different from the work that got him interested in law in the first place. While assisting overworked litigation attorneys who had few chances to dive deep into topics and instead had to pivot wildly from one issue to the next—the exact opposite of how Gray liked to work—he decided that the actual day-to-day reality of being a lawyer was too far from the direction he'd hoped to go intellectually. "My favorite types of work usually involve thinking really deliberately about processes or topics and synthesizing complex arguments. Unfortunately, that's often not what being a lawyer is about." Luckily, his decade in law wasn’t for nothing: His honed logic and analytical skills serve him well as a program manager: “Legal work is about figuring out ways to solve problems, and that’s basically what being a project manager is also all about.” As a program manager, Gray gets to dive deep into and consider complicated and sometimes novel issues. He currently works on-site with a Deja client, one of the largest technology companies in the world. On an average day, Gray spends his morning monitoring, tracking, and reviewing activities on reported vulnerabilities and taking any actions required in coordination with Deja’s security consultants and the client’s security team. Most afternoons, he looks at higher-severity and newer issues, helps Deja’s consultants prioritize, and facilitates communication and remediation between teams.